Love Owls? You're not alone! In fact, there is so many people out there who loves owls that there is a blog dedicated just to owl stuff. It's called My owl barn and they featured me yesterday. The best part? 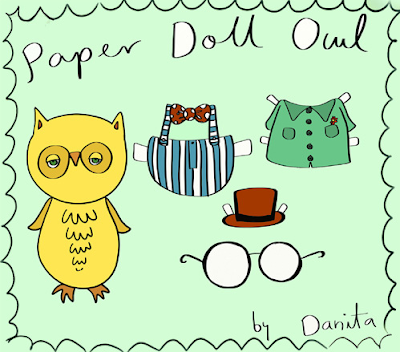 I designed this Paper Doll Owl that you see here for you to download totally free!! Want yours? Head over to the Blog and get it! Meanwhile I'll be putting the finishing touches in the new boxes I'm working on and some new paintings. I spent the weekend cleaning the studio and I felt refreshed and ready to work. And don't tell me this isn't the cutest owl you've ever seen? If my son was a owl, it would be like him. So plump and cute. I will have to make this into a doll because I just want to hug him! Thank you for the free owl paper doll. I loved paper dolls as a kid and so this brings back good memories for me. Yes, that owl is the cutest most studious looking owl I've seen. This is so sweet!! You are right, I love owls:) Your owl is so cute. And it is such a coincidence that you posted this because a few days ago I re-did my blog featuring an owl I painted with water colors some time ago. I plastered him all over my blog:) My little owl is yellow too!! Thanks for the paper owl doll!!! He is the cutest owl I have ever seen and I want to hug him too. I love love love owls! Thanks for the freebie. You inspire me to get crackin' on working on my home studio now! What a wonderful owl! I want to hug him too. Thank you Danita for the adorable paper doll owl. Those painted boxes look beautiful! danita, i have been admiring your work for over 3 years now, and it is unspeakably beautiful. that owl wants a good cuddle! have a little squiz at http://melmacklin.blogspot.com/ and tell me what you think sometime. i am so looking forward, now that i've ventured into blogland, to seeing so much more of your lovely work!